Leading Manufacturer of frp water tank, fiberglass tank, frp tank and frp chemical storage tank from Ahmedabad. To meet the fluctuated necessities of our benefactors, we are included in offering a broad assortment of FRP Water Tank. These tanks are created utilizing prevalent quality crude material which will be which is gotten from the ensured and dependable merchants of the business. Our offered tanks are produced with the assistance of cutting edge machines according to set industry standards and rules. Pioneers in the business, we are putting forth a restrictive scope of Fiberglass Tanks. Use to store different destructive chemicals, these fiberglass tanks are produced with fiberglass and polyester pitch utilizing advance innovation as a part of understanding with industry norms. Our given fiberglass tanks are comprehensively recognized in a few commercial enterprises for their quality and superb solidness. Alongside that, the offered fiberglass tanks can be profited by our clients in different particulars according to their necessities. 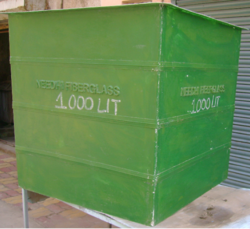 We are leading manufacturer of FRP Tank and we are looking buyer of this FRP Tank from all over india.This FRP Tank is widely acknowledged in between our customers for its low maintenance. We provide this product to our customers at competitive price. With the aid of dedicated workforce and well-equipped infrastructure, we present clients with the premium grade of FRP Chemical Storage Tank. Known for their sturdy construction and portability, the portable digester tank is precisely fabricated by using latest machinery. For the purpose of defecation of human waste, the portable digester tanks are used.